#296 "Napoleon's Swiss Troops, Hellcats on the Prowl, Of Armies and Myth"
Our Jacobite Rebellion 1745 theme content begins with an examination of the two opposing armies which took part in the conflict. You will find useful information on figures, rules and reference material for the campaign in this article. The Jacobite invasion of England contained a number of historical and ‘what if’ gaming options. This article provides the reader with everything he needs to know about fighting with the Jacobites south of the border. Whilst the Prince was away, Lord Lewis Gordon was at play! Following the landing of more allied French troops, the Jacobites in Scotland went on the offensive in an attempt to secure their heartland. This article discusses the gaming potential in their actions. With the Flames Of War supplement Blood, Guts, and Glory recently released, Sean Goodison’s interest in WWII Tank Destroyers was reignited. In this article he discusses collecting a Tank Destroyer army. Hot on the heels of the release of the new Northern Fury supplement for SAGA, we visited Gripping Beast HQ and play tested the new Wooden Oaths multi-player scenario. Battlefront’s James Brown gets messy with clump foliage, paper leaves, glue, and more to bring us this article on the art of “how not to been seen” aka camouflaging your tanks. We’ve teamed up with Warlord Games to bring you an extract from their new Pike and Shotte rulebook. This scenario, and report for the Battle of Pavia 1525, will act as the perfect introduction to the rules. Following his recent Osprey book on the subject, David Greentree introduces these French allies to wargamers. 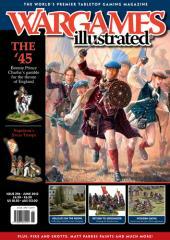 Dave Bodley, of Grand Manner, was the model maker behind our fantastic Crimean War table featured in last month’s issue. In this article, Dave takes us through his creative process when building such a big piece of terrain. We had a great response to the article in WI292 on the Battle of Sedgemoor demo game, so we approached another club member to tell us more about how he went about painting the Royalist army for the game. PLUS we bring you Part Three of our Matt Parkes Paints series and we visit the Cold War's show (US). You can find our June Reviews online.